Bowflex 552 Dumbbells Review! SelectTech Adjustable Dumbbell! 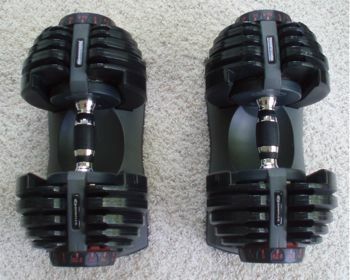 I've had a pair of Adjustable Bowflex Dumbbells in my Man Cave for the past 3 years. If I were to rate them I'd say they rank right up there in the top 5 best purchases of my entire life. I rank them so high because they're incredibly convenient...and convenience in my world equals one thing. In other words, nothing has motivated me to hit the weights more than these dumbbells have. And that includes expensive gym memberships, or the 15 or so pieces of home exercise equipment I've purchased over the years. 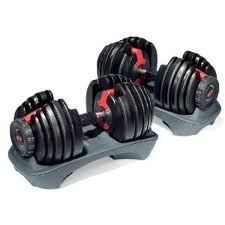 Purchase this one package and you'll virtually replace a small room full of traditional dumbbell equipment. I often recommend these weights to men who have a hard time sticking to a weight training schedule. If this describes you, I'd suggest placing the dumbbells in a room you hang out in on a regular basis. Mine are sitting right behind me as I type this review. 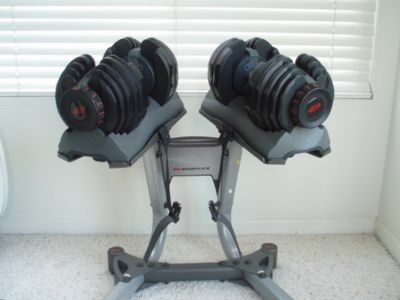 When I get up out of my chair, the first thing I see is my Bowflex 552 Dumbbells. The beauty of this is, I can jump up and use them at a moments notice, switching between 5 lbs, and 52.5 lbs in a matter of seconds. Once you get into this habit, you'll discover how critically important convenience is, especially for those of you who have a hard time getting motivated to exercise. In the time it would normally take you to pack your gym bag, change clothes, and get into your car, you can complete an entire workout. This is by far the biggest advantage of this setup, in my opinion. The picture above is my Bowflex set sitting in a small corner of my room. 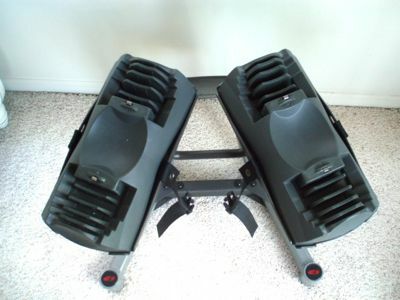 As you can see, I purchased the Optional Bowflex Stand, in order to get them off the floor for easier access. Even with the stand the equipment takes up very little space. If you can afford the stand now, I d recommend it, but it's not essential that you buy one right off the bat. I used mine without a stand for the first several months, with no problems at all. 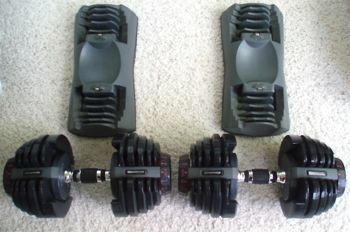 Here's a pic of the dumbbells sitting on the floor, inside the base stations they rest upon. 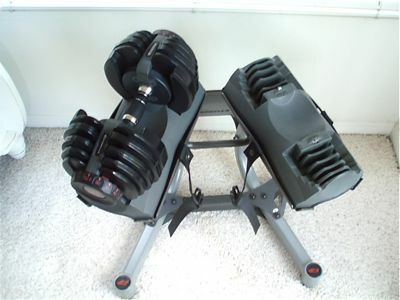 As you can see, the Bowflex 552 Dumbbells rest inside a base, which can sit on the floor, or rest on a stand if you decide to upgrade later one. Also take note of extremely comfortable ergonomic grips. Here's a pic of the empty stand. The straps you see below are used to tie the dumbbells down when not in use. I've never used the straps, but they could come in handy if you have small children running around your house. Here's a pic of the equipment with one dumbbell in the base, and the other side empty. Once you're done with a set, you simply slide the weight back into the grooves of the base unit, dial in another number, and continue on.Here's a pic of the weights off the base units. 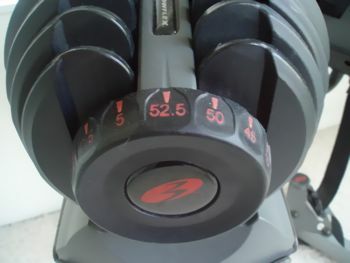 The pic below shows you the Dial you turn to adjust the weight on the dumbbells. Spin the dials, and you can shift between 15 different weight setting, quickly. I often use the speed dialing to do a quick step down routine. For example, one quick set of military press at the 52.5 pound setting. Replace the weights, dial the poundage down to 45 lbs each, and do another quick set. Dial down to 35, and repeat, etc, etc, all the way to the lowest setting of 5 pounds each. This is a killer routine, that creates an amazing pump in just a matter of minutes. Each dumbbell adjusts from 5 pounds all the way up to 52.5 pounds of weight.